This image from the NASA/ESA Hubble Space Telescope reveals a galaxy cluster, known as MACS J0454.1-0300. Each of the bright spots seen here is a galaxy, and each is home to many millions, or even billions, of stars. A new image from the Hubble Space Telescope reveals a galaxy cluster so huge that it acts like a magnifying glass, warping and amplifying light from galaxies much farther away. The new Hubble telescope photo shows the galaxy cluster MACS J0454.1-0300, which is so massive it is the equivalent of about 180 trillion suns. For comparison, the sun is about 333,000 times the mass of the Earth. In this image, released last week, the cluster magnifies galaxies that would be too faint to be detected normally with today's technology. 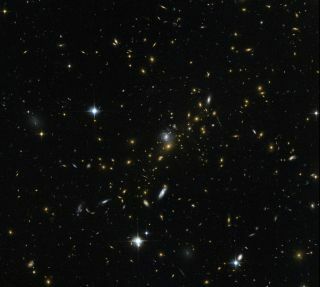 These faraway galaxies, each containing millions or billions of stars, appear as sweeping, elongated arcs to the left of this image, NASA officials said. This magnifying process is known as gravitational lensing. Astronomers are actively taking advantage of gravitational lensing as part of an effort known as the Frontier Fields program, which the Hubble Space Telescope will participate in. These images could also be used help researchers understand dark matter through the way this mysterious substance warps background light, astronomers have said. Scientists have already used one of the Frontier Fields images, revealed last year, to look at galaxy that formed just 650 million years after the Big Bang, when the universe was born some 13.8 billion years ago.